when you're really fine-tuning the motion of the mini mill you'll find that table alignment, binding, uneven wear of the gibs all affect the "handling" of the mill. if you've installed some form of CNC conversion and want to reduce as much friction and backlash from the system one approach is to install acetal components where possible. the advantage of acetal is that it is an easily machineable material that has "high" mechanical strength and rigidity but also offers natural lubricity and is dimensionally stable. there are tradeoffs however in using this material. with an upgraded acme leadscrew and acetal nut and the stock gib strip, we have found that in order to have the gibs adjusted "just right" (i.e. no play) and maintain alignment throughout the entire table travel distance, you have increased flex in the acetal nut when leadscrew positively engages. this build up of "sticktion" and flex leads to noticeable backlash on the order of 0.004"-0.010" (on average in our tests). sometimes even binding occurs at the extremes of travel. to us, things can be improved. call us crazy (or obsessed with this acetal material!) but we want to really get the mini-mill dialed-in as best we can using the cost-effective acme leadscrew/acetal nut combination so the other factor in this equation is the replacement of the stock gib strip with an acetal strip. here's how we did it. first we need the dimensions of the existing strip. it's the x-axis here. the length is 5.900". we're going to be using natural acetal as the stock for the gib strip. 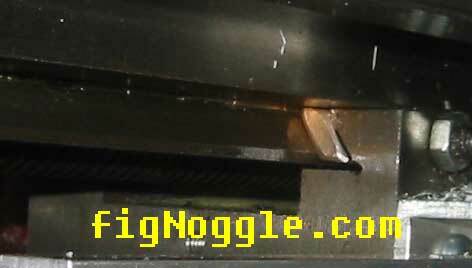 since there was no angle vise to use, we took the shortcut of making the angle 45 degrees. this will offset the intended contact patch significantly but this is a trial run of a prototype. either an angle vise (or something similar) will need to be used or we can fashion a cutter out of drill rod with the appropriate specs. more on that later. in short, a slitting saw was used (be sure to check for vise clearance otherwise you'll end up bending your arbor like we did - oops) to get the stock to the correct width. then with the strip held in the vise, the v-cutter was used to create the angle. simple as that! here's the gib strip holder being milled. note the adjustable angle block being used to set the appropriate angle. you can download the free cad drawing for this holder by clicking here. here are the angle blocks used to determine the appropriate angle for the gib strip. 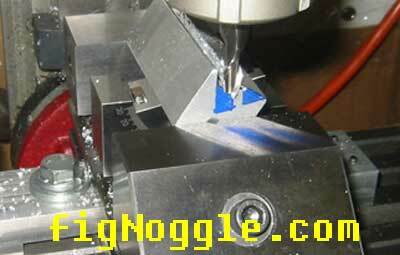 the strip is mounted in the holder which is in turn mounted in the vise. this is interesting. this is the stock x-axis gib strip tightened just right. you can actually see that the strip does not make full contact with the dovetail. look at the upper left corner of the strip. there's a gap. the y-axis is the same. 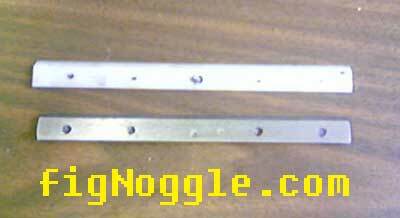 the problem is not with the geometry of the gib strips - it's how the set screws make contact with the strip itself. a better way to force a good contact patchis to perhaps either change the geometry (angle) of the strip and/or to change how the set screws contact the strip itself. this means that the acetal strips (since they're based on the same dimensions as the stock gibs) will also have this problem. when coupled with the acetal nut/acme leadscrew upgrade, there's less resulting backlash due to the "tightened gib scenario". we feel that this should be offered with our upcoming acme leadscrew/acetal nut kit - otherwise, the upgrade would only be partially beneficial.